A great alternative to the traditional camping ritual with tents and sleeping pads is to make use of hammocks. Hammocks to some may seem as dangerous and less sturdy as it is basically a sleeping bag hanging in the middle of the air. But it really is very comfortable and perfectly safe if you know which one to purchase. 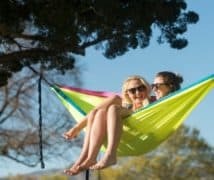 As expensive hammocks tend to be, those of a comparatively lower price may come out as inferior in quality and durability. But taking campers by surprise, the Wise Owl Outfitters introduced hammocks which are not only inexpensive but also very strong in material and of high quality. Two such products of theirs are the Camping Double and Single Tree Hammocks. We will be explaining in this article why these hammocks will be good choices for campers. Q: What has to be the minimum distance between the two posts in order to hang the single/double hammock? 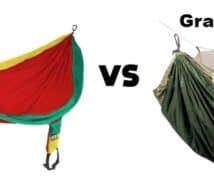 Q: What is the maximum weight capacity of both hammock versions? Q: Does this hammock come with straps and ropes? Q: Do these hammocks close up to protect you from bugs and rain? Q: Are the hammocks waterproof? Q: Does Wise Owl make mosquito nets to go along their hammocks? Q: Are these hammocks washable? For starters, both hammock versions by Wise Owl Outfitters come in 16 different colors, ranging from simple DO Black and Grey to even SO Sea Green. Both also have a heavy duty built which is made with 210T parachute nylon material. If you are not sure what that is like, you would be glad to know that it is the exact material skydivers use for their parachutes! That just shows how sturdy the hammock is while being equally soft in texture and comfortable to lie on. For the nylon, this is supported with triple interlocking stitches for greater strength and sturdiness. If you want to purchase the Single Tree Hammock which can hold one person, you will get the 9 feet long hammock, with a width of 4 ½ feet, weighing approximately 16 oz. It is so light and compressed, when you fold it up it will be the size of a grapefruit. Now, for those wanting to camp out with a partner, it will be suitable for you to go for Double Owl which can hold up to 2 people and also a pet if you wish. It has a length of 10 feet, with a width of 6 ½ feet and weighs around 26 oz. Even though it weighs more than the Single Tree Hammock, it will still only be the size of an eggplant when you fold it up. For great user comfort, you will be provided with two 8 feet ropes that have carabiners attached at each end which supports up to 400 lbs and also instructions for amateurs on how to tie the ropes, hang hammocks, etc through emails. 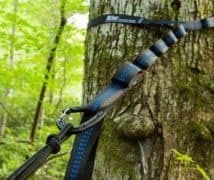 The two 8 feet ropes with carabiners attached are an advantage with this product because most hammocks that can be purchased with a limited budget have ropes of only 2 feet long which limits the compatibility of the product in different situations. Alongside these nautical ropes, you will find Wise Owl Hammock Straps that can sturdily be used to hang your hammock. 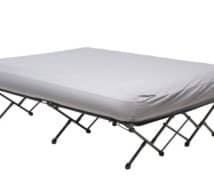 We all know what can be the most troublesome situation when we go camping. For some reason, all sorts of bugs and mosquitoes decide to pay a visit when we are just about to sleep. And let us not even start on the unpredictable weather. But, that is not a problem anymore either. Wise Owl Outfitters is compatible with special gears for protection this time. To save you from getting wet during a sudden downpour, purchase the WiseFly Rain Tarp which can be easily attached to the hammock in less than 5 minutes. For our crawly neighbors, place on the SnugNet Bug Net whenever you feel like it and you will not have to deal with their unwanted visits anymore. Affordable price which easily fits the budget. Sturdy built that can easily support up to 400 lbs. The Triple Interlocking Stitches provides extra strength and durability. Long hanging ropes in comparison are much more effective when it comes to using the hammock in between supports with some distance. Extra protection accessories that could be purchased will enhance the entire camping experience by blocking out bugs and the rain. Very lightweight, both the Single Tree Hammock and the Double Owl. Can be easily carried to anywhere with ease. Amazing customer service is provided, with fast and efficient response rates. For people of a larger frame (of about 6 feet or more), the Single Tree Hammock can prove to be of discomfort while the Double Owl barely makes it through as well. Ans: Up to 12 feet in distance should be perfectly fine. Ans: Maximum weight limit for both of the hammock version is approximately 400 lbs. For people with smaller frames, two can easily fit inside while also taking a pet with them. Ans: No, both versions of the hammock come with ropes but compatible straps can be later attached. Ans: No, they do not close up over you. 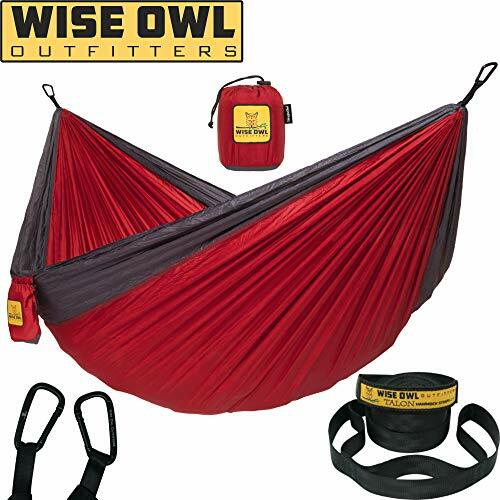 If you wish to have that function for your hammock, you can look for the protection gears that are compatible with Wise Owl Outfitters products. Ans: No, they are in fact, not waterproof. But alternatively, they do tend to dry out pretty fast. Ans: Yes, they do. They are not in the market yet as they are still being tested, but they will be introduced soon enough. Ans: Yes, they can be easily washed or wiped with a wet cloth. Wise Owl Outfitters managed to produce cost-efficient products with great quality that are no less than their more costly counterparts. Both versions of their hammocks are well thought out to provide utmost comfort and compatibility while keeping the price to the minimum. Whether you are a pro when it comes to camping or just a starter, choosing any of these two hammocks reviewed here produced by Wise Owl Outfitters will surely provide you with the best possible service.